Chicken Florentine: Grilled Chicken covered with spinach and a cheese blend, then topped with cherry tomatoes and green onions. Tilapia Oscar: Panko breaded tilapia topped with a crab cake, asparagus, and vermouth cream. Comments Off on Happy Mother’s Day Weekend! Happy St. Patrick’s Day everyone! We have Corned Beef & Cabbage as our special as well as many new Specialty Drinks! We hope to see you very soon! Comments Off on Spring is here!! Spring has Sprung!!! We have our NEW MENUS coming out THIS WEEK! Be sure to come in and check out favorites, old and new. And don’t forget about our huge patio! Perfect for relaxing on these beautiful days! Don’t forget, every Wednesday night we have live music from 8:15-11! Its always a great time! Be sure to come out and try our fall craft beer selection! Its amazing! Comments Off on Contact us Via Email. Hey everyone! Just quick note, we will be without a fax machine for a week. 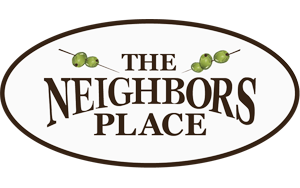 If you have any documents you would like to send us please do so via email at comments@theneighborsplace.com. Thank you! Comments Off on Halloween Party!